In a warehouse, factory, or any facility that operates forklifts, collisions are costly. They can even be deadly. OSHA training standards attempt to rectify the disproportionate number of injuries and damage lift trucks cause with training. Cisco-Eagle agrees that better operator training will help, but there are other ways to reduce the potential for injuries, death, and damage. Forklifts and foot traffic shouldn't mingle if they don't have to, and with the right warehouse design, equipment and processes, lighting, and environmental factors, you can significantly reduce the chances for a lift truck and a person to cross paths, or for a lift truck to run into a building column, a rack upright, equipment, or stored inventory. 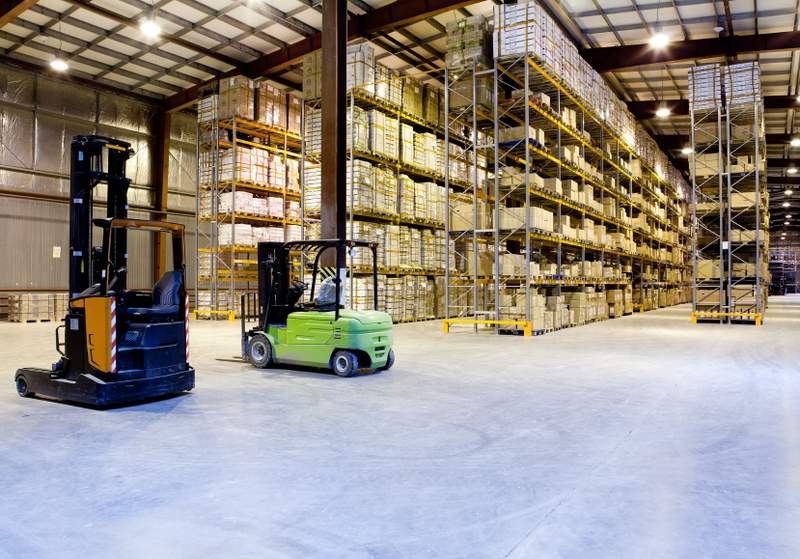 Warehouses that are too dark can cause injuries. This simple improvement can reduce the chances that an operator won't see people or objects in his traffic aisles. It seems simple, but the fact remains that a well-lit, clean warehouse environment within the acceptable level for general operations will reduce accidents. 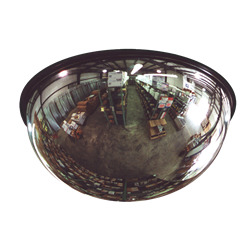 Consider enhancements items like Safety & Visibility Mirrors to improve floor visibility. They're inexpensive and can be mounted on ceilings, rack uprights, and other equipment to increase the chance that operators will see what's in their path--or around the other side of that row of Pallet Racks. When forklifts enter and leave controlled areas, consider using Vinyl Strip Doors at door-points to control the environment while allowing easy access and good visibility. The forklift driver can see activities on the other side of the door, and people working on the other side can see the forklift coming. A noisy facility increases danger, since workers have less of a chance of hearing the warning noise or a forklift's engine. Certainly, there are many operations that must take place in louder environments, but machinery can be muffled to be quieter, and processes to be certain people know a forklift is in operation can be created. Certain Conveyors and systems, such as EZ-Logic Accumulation Systems, operate much quieter than typical systems, for instance. Installing the correct lighting system can also prevent accidents (and save money on energy costs). One of the easiest ways to prevent forklift collisions is by creating areas where forklifts are supposed to be--and where people aren't. You can "hard" segment these aisles with hardware such as Steel Guard Rails. Tape markings also work, but they aren't obtrusive, keeping the lift truck on its side and the pedestrians on their side. It is hard to ignore bright-yellow, painted steel barriers. It's easy to ignore tape on the floor; one person, be he a forklift driver or a pedestrian, can easily miss those lines, or ignore them through inattention. While it isn't always possible to erect solid barriers, but when you can, it's much more effective. Utilizing gates such as AisleCop forklift aisle safety systems can prevent pedestrian crossings at critical aisles and dangerous or blind spot areas. Traffic Islands work even better. It's simply a matter of defining where forklifts aren't supposed to be and erecting barriers to stop them from being there. Barriers surrounding workstations, assembly points, in-plant offices, and other "people" areas are also recommended. 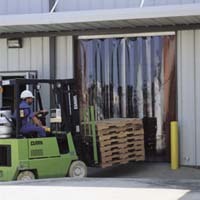 Simply erecting inexpensive guardrails around a packing station, computer terminal, assembly station, or pick-point can instantly remove the potential for an errant lift truck colliding with personnel. When a collision does occur, you can reduce the cost of that accident by utilizing material handling equipment to protect conveyors, rack uprights, workstations, and building columns. Building columns are a problem since damaging them can be particularly expensive and dangerous. Utilizing Column Protectors enhances the visibility of the column and protects it in case of an accident. 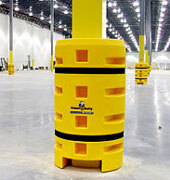 Column protectors disperse impact forces, protecting the lift truck as well as the building column. Bollards can protect dock doors and other equipment by erecting a solid steel vertical barrier that protects a limited amount of space. You should also protect your pallet racks. Damage to them can cause dangerous rack failure. 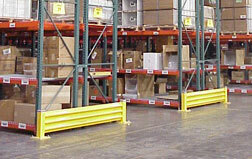 Once again, simple Steel Guard Rails work great to run across the end of a row of racks and create a forklift barrier. For the upright columns themselves, using simple steel column protectors, or impact-absorbing rack column cushion guards can alleviate significant risks. Training, design, equipment, and processes can all add up to helping you reduce the potential for serious injuries, protect your people, protect your buildings, lift drivers, equipment, and inventory. Want more information? We'd be happy to discuss any of these methods with you, or to consult on your situation.